I have changed a few files name by de-capitalize the first letter, as in Name.jpg to name.jpg. Git does not recognize this changes and I had to delete the files and upload them again. Is there a way that Git can be case-sensitive when checking for changes in file names? I have not made any changes to the file itself. If true, this option enables various workarounds to enable git to work better on filesystems that are not case sensitive, like FAT. For example, if a directory listing finds makefile when git expects Makefile, git will assume it is really the same file, and continue to remember it as Makefile. The default is false, except git-clone(1) or git-init(1) will probe and set core.ignorecase true if appropriate when the repository is created. Two steps because otherwise I got a “file exists” error. Perhaps it can be done in one step by adding --cached or such. Under OSX, to avoid this issue and avoid other problems with developing on a case-insensitive filesystem, you can use Disk Utility to create a case sensitive virtual drive / disk image. git config core.ignorecase (this returns the current setting, e.g. false). git config core.ignorecase <<true or false>> - set the desired new setting. git config core.ignorecase <<false or true>> - set config value back to its previous setting. If your repository is hosted on GitHub like mine is, you can rename the file on origin (GitHub.com) and force the file rename in a top-down manner. The instructions below depend upon the type of file you're attempting to rename, that is, whether it's a file type that GitHub deems as editable (code, text, etc) or uneditable (image, binary, etc) within the browser. Does GitHub allow you to edit the file within the browser? Mac OSX High Sierra 10.13 fixes this somewhat. 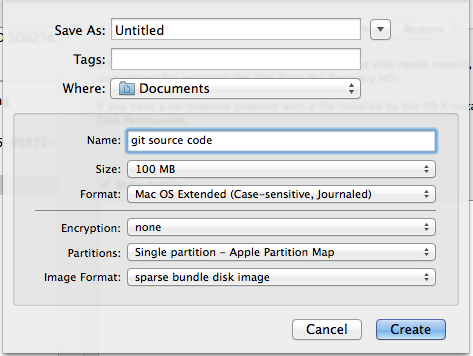 Just make a virtual APFS partition for your git projects, by default it has no size limit and takes no space. I've faced this issue several times on MacOS. Git is case sensitive but Mac is only case preserving. Now drop your workaround git rebase -i HEAD~2 and drop the TEMP COMMIT!! remove all non-git files and folder to a different folder/repository. add all the files back into the original git folder/repository. commit current non-empty git folder. This will fix all the case issues without trying to figure out which files or folders you renamed. git commit -a -m "Versioning untracked files"
If nothing worked use git rm filename to delete file from disk and add it back. Not the answer you're looking for? Browse other questions tagged git case-sensitive git-commit git-config or ask your own question. How to make Git notice the filenames' capitalization changes for the commit? In a Git repository, how to properly rename a directory? Is there a naming convention for git repositories?